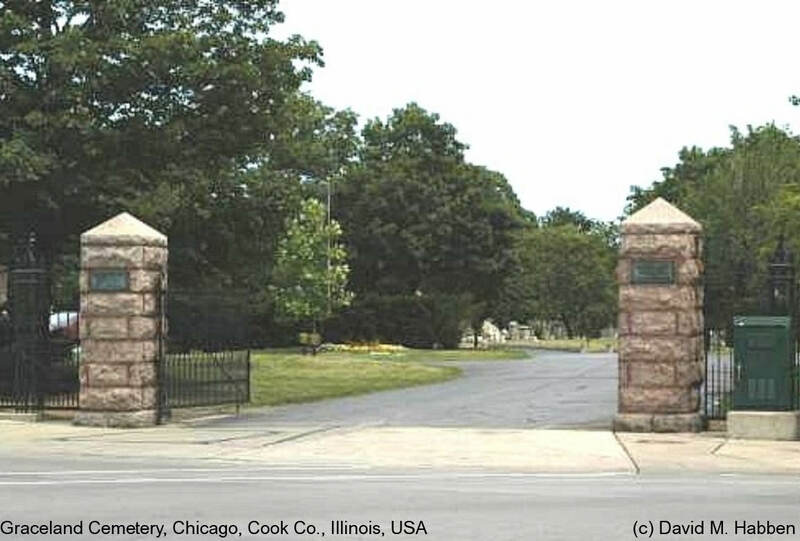 According to the Graceland Cemetery "If you are searching for someone buried in the Graceland Cemetery, please send in your inquiries by mail, fax (773-525-9091) or email to info@gracelandcemetery.org. Please provide the name and approximate time of death and any other information that may help assist with the search. We will respond to your inquiry within a week depending on the extent of your request and provide you with the exact location of the burial plot, if any. There may be a small fee depending on the extent of the search." Established in 1860 and designed by landscape architects, O. C. Simonds and H.W.S. Cleveland, Graceland is truly a haven in the city. Walk through the cemetery and pay your respects to pioneers like Dexter Graves and John Kinzie, early settlers in Chicago, and to business leaders such as developer Potter Palmer, railroad car manufacturer George Pullman and Cyrus Hall McCormick, who revolutionized American agriculture with the invention of the mechanical reaper and other farm machinery. Other Chicago "giants" buried here include civic planners and builders Daniel Burnham and Charles Wacker: Marshall Field, the retailing genius; Martin Ryerson, lumber merchant and developer; newspaper publisher Victor Lawson; meat packer Phillip D. Armour; and Carter Harrison, Sr., five term mayor of Chicago. World famous Chicago architects such as John Root, William Holabird, Louis Sullivan, Howard Van Doren Shaw, William LeBaron Jenney and Mies Van der Rohe are also buried here. The monuments and buildings designed by Sullivan, Holibird & Roche and McKim, Mead and White, among others are still viewed as primary examples of their work. As part of its ongoing restoration, Graceland recently completed construction of a new columbarium which is designed to reflect the enduring nineteenth century style of the Cemetery. Open to all, Chicagoans and tourists can relax amid the quiet beauty of Graceland's curving tree lined lanes. We welcome your visits and inquiries and ask only in return that your conduct, while our guest, demonstrates a respect for those who are buried here. O. C. Simonds is the person responsible for the beauty of Graceland Cemetery as we know it today. Simonds served as the Cemetery's superintendent and chief landscape architect from 1881 until 1898. He continued working at the Cemetery until his death in 1931. During his tenure, Simonds transformed Graceland into a masterpiece of Midwest landscape architecture for which the cemetery was awarded a medal of excellence at the Paris Exposition of 1900. Graceland was also honored by acceptance on the National Register of Historic Places in 2001. Simonds vision for Graceland was of a beautifully landscaped park created by an abundance of plantings with carefully planned vistas and natural topographical and water features. The park reflects a celebration of life. Simonds' landscape designs represents the classical intergration of buildings and landscape, involving a number of distinctive monuments. This is the design that Simonds created, developed, and finally perfected in his long tenure as cemetery landscape architect. Because of Simonds vision and dedication, landscape historians regard Graceland Cemetery as "one of the most remarkable park-like cemeteries of the Western world." Please use this search to post grave/plot locations on the memorial or in your photo request.